Interpreting Behaviour: Are You Good at It? Where do Habits Come From? What Makes a Good Apology? Do You Have THIS Trait Linked To Success? Training Your Brain: Are You Training for the Right Result? Reach the BIG goal: Where Will YOU Be in 100 Days? The Habit of Self-Delusion: Do You Have It? Asking for Help: Strength or Weakness? How Well Do You Manage Expectations? Why Is It So Difficult To Change? 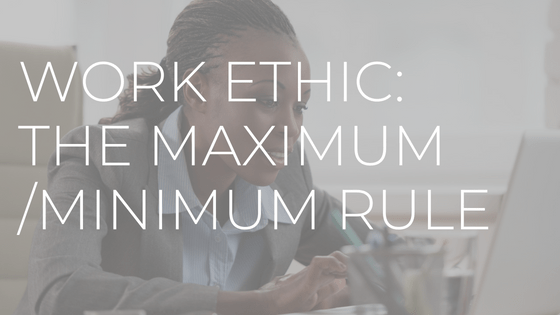 Whenever the topic of work ethic comes up, I am reminded of the story a client told me many years ago of a conversation she had with an employee.She was conducting a performance evaluation and they were reviewing his results. She was providing feedback from his immediate supervisor and coworkers who felt he was capable of doing far more than he was actually delivering. They believed he was not living up to his potential, and was letting down the rest of the team.When presented with the information the young man explained it all with a simple solution. “Pay me more and I will work harder.”For some strange reason my client did not share the same enthusiasm for this solution as did her employee.There is a habit shared by nearly all those who have climbed the rungs and worked their way to the top of the ladder.The Habit of Doing More Than You Are Paid To Do has long been recognized as a sure-fire way of ensuring tomorrow’s rewards are built by today’s efforts.In my volunteer job as a member of a condo board of directors, I have sat in many meetings at which potential service providers to our complex have attempted to convince us to use their services and buy their products.And all too often, we have selected vendors and contractors only to experience deep disappointment when they failed to deliver on all they’ve promised. What is even more disappointing is the lengths to which some will go to explain and justify poor performance rather than acknowledging, and then correcting it.The willingness of many of these folks to overpromise, and then underdeliver, is the very antithesis of any model necessary to build a great business and we have learned to take swift action to terminate our relationships when this happens.The very notion that “if you pay me more, I will work harder” is an extension of what, in my company, we call the Maximum/Minimum Rule.This rule states that the maximum effort an employee will produce is the bare minimum required to avoid drawing negative attention to themselves.In other words, the least they can get away with is the very most they will contemplate doing.Both the statement “if you pay me more I will work harder,” and The Maximum/Minimal Rule reek of entitlement and speak volumes of the person’s work ethic.The Habit of Doing More Than You Are Paid To Do is also known as discretionary effort, and is something that no company can achieve greatness without. Discretionary effort is the selfless willingness to go above and beyond what is expected and to deliver more than required with no expectation of extrinsic reward nor any fear of reprisal or recrimination for not doing so.It is simply the extra effort put forth for no reason other than “I want to, it’s who I am.”I know of no adherent to either the premise of pay me more and I’ll work harder or the Maximum/Minimum Rule who was ever risen to stellar heights in their career or built a highly successful business.To under promise, or agree to stated expectations, and then overdeliver is by far the desired method for growth, success and prosperity.The Habit of Doing More Than You Are Paid To Do, once it has, indeed, become a habit provides a rare opportunity to earn a return on investment that is a massive multiple of the investment itself.It’s the “big break” that so many spend their lives looking for, and it’s available to all.It really is that simple.Let’s make a habit of meeting like this.